Roberts, John D. - concerning : Early Ideas in the History of Quantum Chemistry. at the Right Time. p. 22. John D. Roberts was born in 1918, starting his career in 1922 as observed at left, this being 5 years before Heitler and London came out with their famous QC paper in 1927! 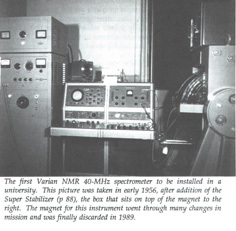 As seen at right he continued research in 1948 (dipole moments - an important topic around then) with the help of UCLA (B.A. 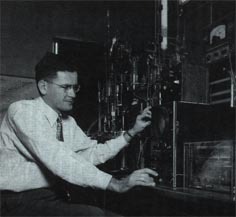 1941, Ph.D.in 1944), delayed by activities due to WW 2. He became Prof. at MIT and then Prof. at Caltech where he is still active. 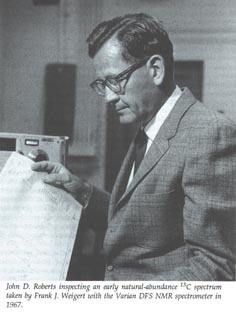 His work is centered on mechanisms of organic reactions. Roberts, J.D. : Nuclear Magnetic Resonance. Mc-Graw-Hill, New York, 1959. Roberts, J.D. : Notes on Molecular Orbital Calculations. W. A. Benjamin, New York, 1961. Roberts, J.D. : An Introduction to the Analysis of Spin-Spin Splittings in High Resolution Nuclear Magnetic Resonance Spectra. W. A. Benjamin, New York, 1961. Roberts, J.D., Caserio, M. : Basic Principles of Organic Chemistry. W. A. Benjamin, New York, 1977. 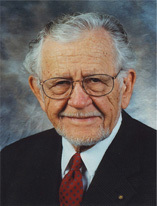 Roberts, J.D. : At the Right Place at the Right Time. ACS-Books, Amer. Chem. Soc., 1990. Roberts, J.D. : ABC's of FT-NMR. University Science Books, 2000. It is Roberts' very vivid description of the going-ons at the time when Huckel (Hückel) theory became known and used. 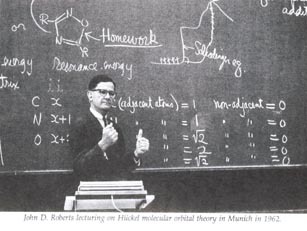 Young chemists today might want to pay particular attention to Roberts' fight with the then famous book of Eyring, Walter and Kimball : Quantum Chemistry. Please excuse the 'reduced quality only' section of the following. For more - and better print - see At the Right Place at the Right Time. and wants to work with you. at the Right Time. p. 63. Copyright © Dec. 3. 2001 by U. Anders, PhD.